This week I texted my friend to see what she was up to for lunch, thinking that we would head to the cafeteria or make something quick in her apartment. 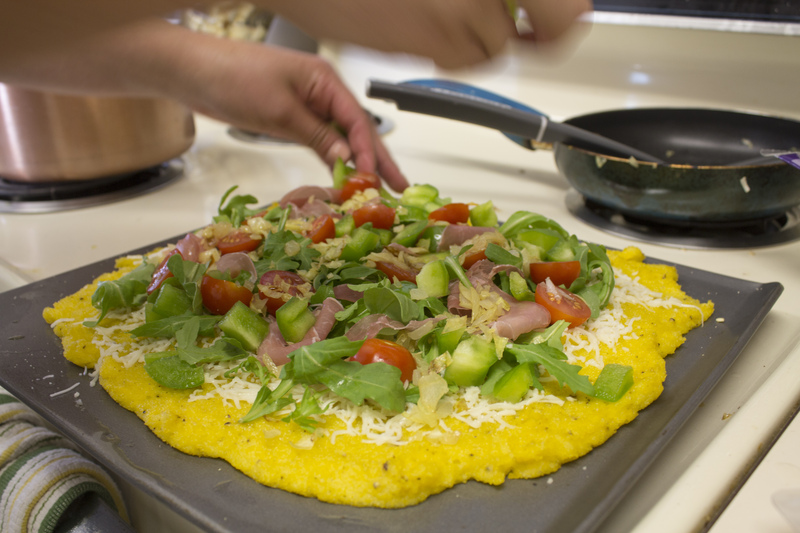 She responded by saying that she was making polenta pizza with fresh veggies and prosciutto. Obviously I dropped what I was doing and power-walked to her apartment to join her. This recipe was found in a Williams-Sonoma cookbook that she was given for her birthday recently. It seems to be the first of many recipes that we will fall in love with! 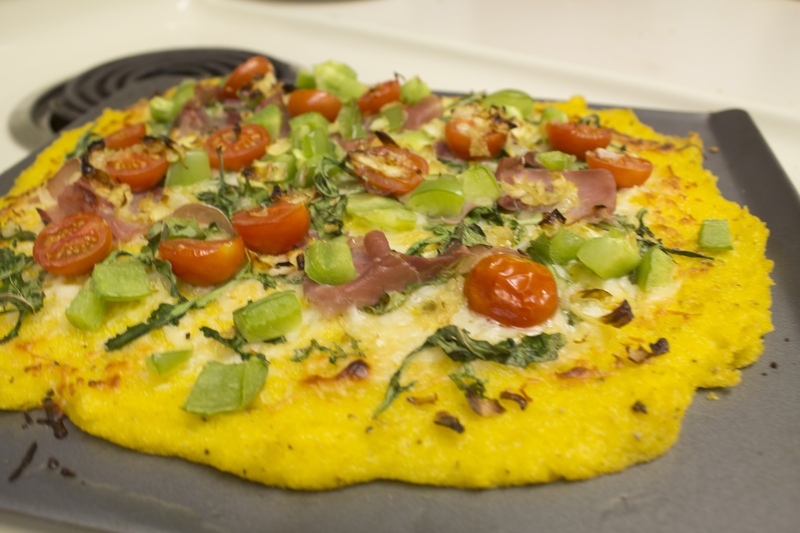 The peppery polenta added much more flavor than a traditional crust with its rich, buttery flavor. Whoever said gluten-free eating couldn’t be delicious has not seen this book. We followed this recipe exactly as written. We decided that that crust would have a better texture if you had a larger pan than the 11″ by 13″ that we had, made less than the recipe calls for, or spread it onto two pans. We both prefer a crisp, thin crust pizza, but If you like a thick crust you can stick to these amounts! The toppings are where we really got creative. Instead of using a tomato sauce, we brushed the crust with some olive oil before adding about 1/2 cup mozzarella cheese. We halved some sweet cherry tomatoes, diced a small green bell pepper for crunch, and sautéed 1/4 of a large onion in olive oil. Lastly we added 2 handfuls of arugula and a few pieces of prosciutto to get a little pop of salt and protein, and off it went into the oven! The beauty of this recipe is that there are literally infinite possibilities! We are already planning for next time to do a pear, arugula and gorgonzola recipe that we’ve made on regular crust before. 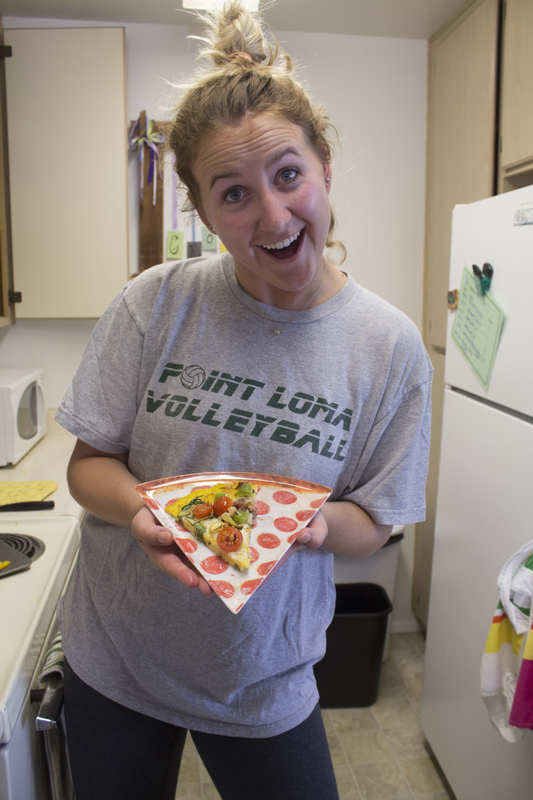 And of course if you eat your pizza on a pizza plate it tastes even better! She may have a little bit of an obsession with food-themed trinkets and gadgets. 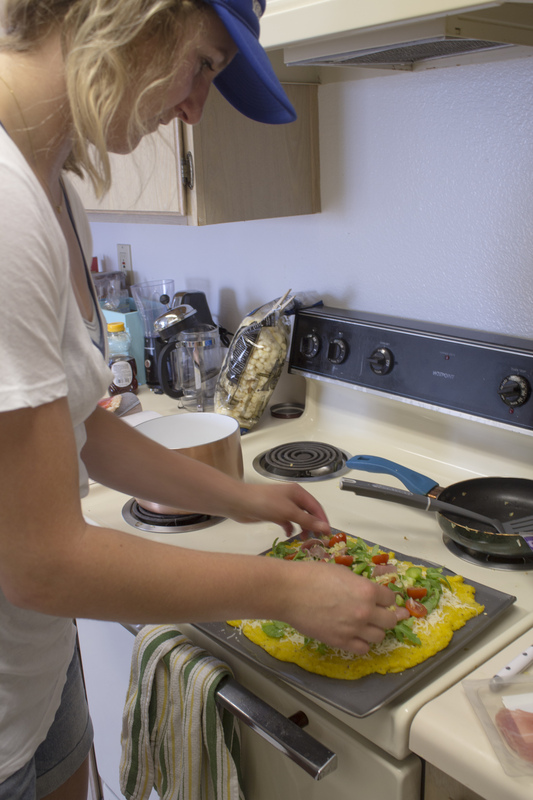 This pizza made for a deliciously satisfying lunch for us. Hope you get the chance to try it out for yourself!